Tonight I had my first successful experience with Google Hangout. Wow! I say first successful experience because I tried it last night too, while at work, but it didn't seem to work. The question is why? Why google hangout? What prompted this hangout. As I am very certain you are all aware I am a bit of a twitter junkie. I love meeting and chatting with new people. I love learning and sharing with others. 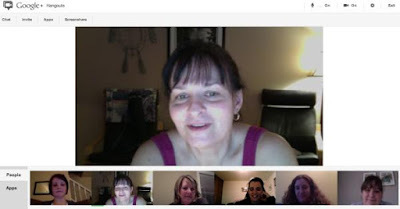 One group that I spend of fair bit of time chatting with are the people I've met on #1stchat. It's a really great group of educators and since they actually teach the grade that I teach they get it. Anyhow a few weeks back some of them had another hangout discussing something educational (and for what ever reason I can't remember) but I wasn't able to join (I know there was a good reason, and it would have involved me doing some serious multi tasking but for the life of me I can't remember why either). Then this week I dug a little deeper into getting Skype to work in my classroom. I tweeted a few classrooms which lead to the suggestion of a Google Hangout. One classroom teacher's suggestion of meeting in Google Hangout grew to six classes meeting together at the same time in Google Hangout. The idea was born that we (our students in particular) were going to share their writing with one another through Google Hangout. Last night my #1stchat twitter friend Jill, @jaxbeachteach from Florida, said she'd be on line so that I could give Google Hangout a try. I wanted to try it at work because I wasn't sure if it would work or not and I didn't want to get my students all excited about meeting and chatting with other students from around North America to find out that we couldn't. As it turned out it didn't work at school. I'm still not exactly sure why but I think it may be a band with issue (what ever that means). This is something I will investigate further. It could have also been something with Google Hangout because my friend in Florida couldn't really make it work with me either. Anyhow, this evening the teachers decided that it would be a good idea to try the hangout first to plan for the official (with our classes) hangout scheduled for Friday morning. We scheduled to meet at 9:00 pm EST. Although I couldn't make it on time I did make it while they were all still there. Now imagine, these are people I have never met (other than reading their blogs, sharing the odd e-mail, or seeing their twitter profile) but I have had countless conversations with them. As soon as I logged on to Google Hangout they were all there, staring at me! It was the first time I had ever see any of them "live". Yes, I know not really live but I heard their voices and I saw them talk. At first it was a bit over whelming, but it quickly became normal. Obviously I asked the silly questions like, "why are some of us so small and why is one person so big?" Like they do on twitter they answered my questions - when you talk your picture gets bigger and it moves to the top centre box. Anyhow the conversation went back and forth as we (well really they since I don't think I'll be able to join them) made a plan for Friday. Wow, those are lucky children. On Friday five classes from around North America are going to get together to listen and comment on one of the classes students' writing. We also talked about having Jill lead a lesson for all the classes since she spent the last ten years as a educational coach. We talked about a lot of other things too, some serious, some certainly not so series. Remember we all teach grade one, which means we all are aware of the laughs we get from our students every day. Anyhow it was a really positive experience. When it was all over we tweeted one another thanking each other for the hangout. Christine, @cyarzy, was smart enough to take a screen shot of our hangout which she said was okay for me to use on this post. So here it is! My question is, have you ever used Google Hangout? What potential do you see for its use? And yes, I will look into why it didn't work at my school, and how I may (if possible) get it to work. I mean really, can you imagine seven grade one classes learning and sharing together! So cool! I want to try!!! (by the way, Karen - it is band width - that determine how much data can transfer through over the internet at a certain time).